The Respect Program and J.P. Mascaro & Sons would like to acknowledge students who are standouts in their classrooms, schools, and communities with the STAR STUDENTS OF THE YEAR Award. Nominated students should demonstrate qualities of good citizenship and provide evidence of making positive and respectful choices in their daily lives. 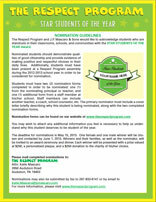 Additionally, students must have been present at a Respect Program assembly during the 2012-2013 school year in order to be considered for nomination. Students must have two (2) nomination forms completed in order to be nominated: one (1) from the nominating principal or teacher, and one (1) additional form from a staff member at his/her school. Staff members can include another teacher, a coach, school counselor, etc. The primary nominator must include a cover letter briefly describing why this student is being nominated, along with the two completed nomination forms. You may wish to attach any additional information you feel is necessary to help us understand why this student deserves to be student of the year.